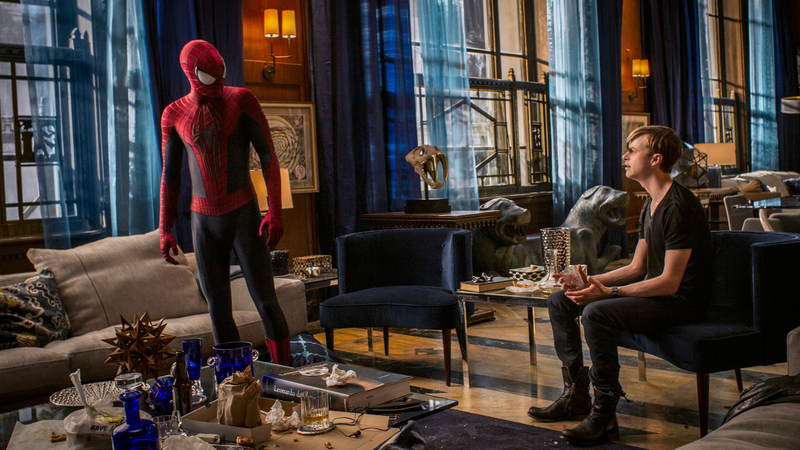 Directed by : Marc Webb. Cast: Andrew Garfield, Emma Stone, Jamie Foxx, Dane DeHaan, Felicity Jones, Paul Giamatti, Sally Field. Let’s be honest, I’ve always been a sucker for Spiderman. So you may feel this review is a little bit biased by my love for the character. When I was a little skinny 5 years old boy I used to dress up in a Spidey costume and I remember feeling invincible (despite the fact that I looked even skinnier and more feeble than ever with those red and blue tights on). When the first Amazing Spider-Man was released back in 2012 I was there on opening night, on the biggest IMAX screen Britain has ever seen (or so the slogan says), dragging my pregnant wife (Little Jr. inside the belly wasn’t too pleased about the loud subwoofer apparently), filled with excitement, despite fearing the worse (early trailers didn’t look that good) and hating the idea of a new reboot so soon after Raimi’s trilogy. In the end Andrew Garfiled managed to win me over and I was probably one of the few bloggers out there completely satisfied with the Marc Webb‘s reboot (You can still read my review for the first film here). The Amazing Spiderm-man 2 swings into our screens followed by an overwhelming number of trailers and teasers. So many in fact that I walked into the theatre feeling that I had already seen most of the film. Luckily, there were enough surprises throughout to keep it all fresh, including the biggest surprise of them all which obviously I am not going to reveal (but which will be the one that you’ll be dying to talk to somebody about, after you’ve seen this film). Well, let me tell you straight away: I loved this movie! This is my idea of a perfect Comic adaptation: a mix of humour, action, over-the-top baddies, and some emotionally charged scenes. And once again, just like in the previous instalment, this is where director Marc Webb shines: the relationship with between Andrew Garfiled and Emma Stone is almost tangible and it’s definitely one of the strong cards; credit to the director of course, but also and especially to the actors). Garfiled, first and foremost, doesn’t just inhabits the character to perfection (Tobey Maguire is now completely gone from my memory) but he also manages to make him relatable, funny and bizarrely… real! I must confess he even managed to bring a few tears into my eyes a couple of times. The pace, the action and the special effects, all seem to have gone up a couple of gears too. Right from the bright and energetic beginning as the camera swoops through the skyscrapers of Manhattan, this feels straight away a much more confident film than the first. There’s no more comparisons to draw with an already told story and the ghost of Raimi is nowhere to be seen despite the fact that his previous “2nd SpiderMan” is possibly known as one of the best superhero movie ever (I can hear a lot of Avengers fans screaming with rage… hahaha). Manhattan itself takes centre stage like only the big Apple can do, while a series of perfectly cast characters enhance every moment in the film: from the forever-reliable Sally Field and the surely future Oscar winner Dane DeHaan (I don’t think you can argue with this premonition), to the deliriously over-the-top Paul Giamatti and the electrically charged Jamie Foxx who manages be sad and terrifying at the same time. If there is one criticism to make is probably that the film tries to do too much, as it handles too many threads and character and runs for a bit too long (what film doesn’t these days? ), but I would be lying if I said that I didn’t enjoy every single moment and I did not look at my watch once. Yes, the editing is a bit choppy and the order of some of the scenes sometimes feels a bit arbitrary (clearly they must have left a fair bit in the editing room), but it’s all entertaining enough and it all runs along at a brisk pace that you hardly notice it. Call it what you want, escapism, pop-corn film-making, Hollywood money-sucking machine… but when I go and see a movie called Spider-Man, this is exactly what I want to see. Amazing spider-man 2 was just that, amazing. Personally I felt the movie was long but at the same point I wasn’t completely happy with some stones unturned. Especially considering there were some scenes that had no real baring on the movie. All in all though it’s a great movie and I look forward to the next one.